Ascot Golf Club was founded by local Barrister F.J. Patton in 1887 and given Royal status by Queen Victoria later that year. Joseph Longhurst was appointed the first club professional in the same year, a role he held for 25 years. Many of Queen Victoria's children learned to play golf at Royal Ascot and The Prince of Wales, later King Edward VII, was patron of the club in 1901. At first, Royal Ascot Golf Club and Ascot Ladies’ Golf Club each had a nine-hole course on Ascot Heath in the middle of the racecourse. In 1895, the two clubs amalgamated and a new 18-hole course was designed by J.H. Taylor, then holder of the Open Championship which he won five times. In 1921 Royal Ascot Golf Club hosted the inaugural British Boys Championship on the Heath and presented the R&A with a cup for an annual tournament which is still played for today. The Championship was held on the Heath again in 1922. That first year both Henry Cotton and his brother played, but Henry was defeated in the first round. Some golfers found the Heath course rather difficult and in 1900 several Royal Ascot members helped found Sunningdale Golf Club. As other top-class courses like East Berkshire, Swinley Forest, Wentworth and The Berkshire emerged, Royal Ascot went into decline later in the 1920s. The course eventually came under the control of the Ascot Authority and during World War II was requisitioned by the War Office. The club was re-formed in post-war years and improved the course and clubhouse. The Centenary was celebrated in 1987 with a week of events opened by Henry Cotton. The new premises became necessary when the Racecourse Authority announced plans in the year 2000 for a major redevelopment of the racecourse. This led to the Club moving to a new course across Winkfield Road on the site of the former Ascot Farm, once a medieval deer forest. Ironically, 100 years earlier it had been the home of a small golf club for local traders know as Ascot St George’s. RAGC moved into its new clubhouse just before Christmas 2004, while still playing on what remained of the old Heath course. 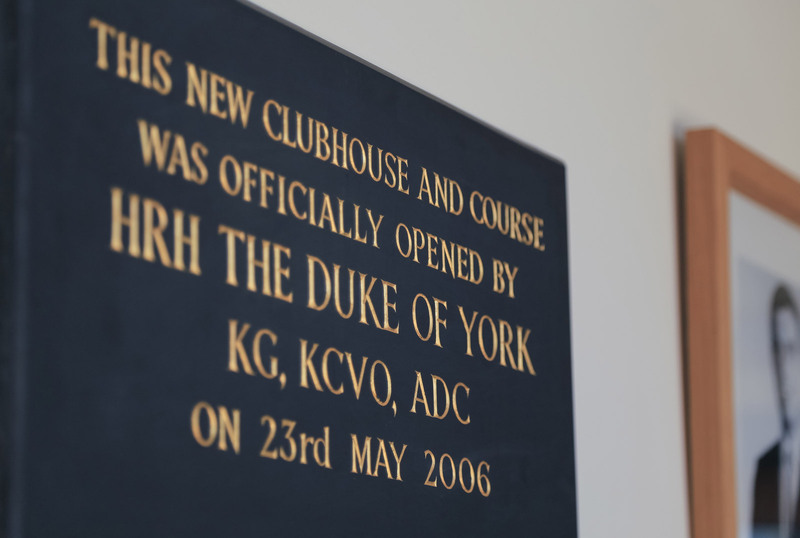 The new course opened for play in August 2005 (Barry Lane a distinguished member and former Ryder Cup player played in the first match) and was then formally opened by the Club patron HRH Prince Andrew, Duke of York, in May 2006. Royal Ascot celebrated its "125th Anniversary year" during 2012 and is the oldest golf club in the area now playing on a modern and challenging course. Barry Lane, began his career as a junior at Royal Ascot and turned Professional in 1976. Made over 500 appearances on the European Tour. His achievements include: Ryder Cup Team 1993, German Masters, European Masters and the Anderson Consulting World Championship. Regularly finished in the top 50 of the Players Volvo Order of Merit. Anthony Wall, another former junior, is also on the European Tour and regularly participates in Tour Competitions and won the 2000 Alfred Dunhill Championship in South Africa. Michelle Scobling, obtained her card for the Ladies European Tour and in her second year on the circuit very nearly won the Ladies European Open Competition. Guy Woodman is also enjoying some success on the Challenge Tour and has featured in a number of professional tournaments and winning the National PGA Assistant Championship in 2008.